One of the most important elements for complex life on Earth is oxygen. In a recent publicity video, NASA explained how its IBEX Mission found that the solar system is oxygen-rich compared to its surroundings. The original press release is here, and the results were published in a series of six articles in the Astrophysical Journal – you (or your institution) need a subscription to see the ApJ article. The IBEX Mission measured the ratio of neon to oxygen in neutral atoms that slipped through our Solar System’s protective heliosphere (neutral particles are not affected by its magnetic field, so they pass right through) and determined that there is more oxygen for each neon atom inside our Solar System than outside. 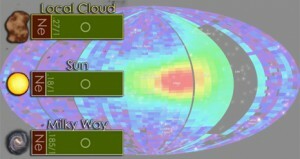 Figure from IBEX Mission showing the neon-to-oxygen abundance ratios (the number in each bar) in the Local Cloud, Solar System, and Milky Way. The widths of the neon (crimson) and oxygen (green) bars also illustrate this ratio. The Mission scientists posit two theories to explain the relative over-abundance of oxygen in our solar system: (1) the sun originally formed in a part of the galaxy with an oxygen abundance different from that of our current location, or (2) much of the oxygen of the interstellar medium (the space between stars) is trapped in grains of ice and dust, and was thus not detected by the IBEX Mission. Either explanation could have important implications for astrobiology, and for understanding the formation of our solar system and others.